Boeing recently announced the addition of Echo Voyager to its fleet of unmanned undersea vehicles (UUVs) developed by their research and development division, Phantom Works. Echo Voyager is the largest of the innovative UUV family, joining the Echo Seeker and Echo Ranger. Echo Voyager is capable of operating autonomously at sea for months at a time due to its hybrid rechargeable power system supported by a lithium-ion energy storage solution from Corvus Energy. Unlike typical UUVs such as the 18-foot Echo Ranger and 32-foot Echo Seeker, which can stay at sea for only a few days before being re-charged by a surface ship, the 51-foot Echo Voyager can explore the oceans for up to 6 months without returning to a support ship. This extreme capability is enabled, in part, by the Corvus-developed energy storage system (ESS). The ESS powers Echo Voyager for a few days before using an onboard diesel generator to recharge the batteries. Echo Voyager represents the second UUV project of which Corvus technology has been an integral part. 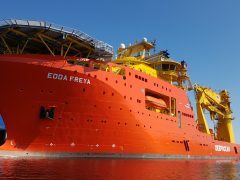 “Corvus is known largely for its product lines for merchant vessels, offshore vessels and port cranes. We have been an extremely proud contributor to Boeing’s UUV programs for several years now and are excited to be able to share this news with the industry” says Corvus President & CEO Andrew Morden. “This bespoke work highlights the capabilities and depth of our R&D teams and gives the market some insight into another interesting aspect of our business”. Echo Voyager will undergo sea trials this summer. Future missions could include scientific, military or oil and gas exploration. 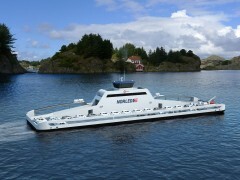 It can accomplish these tasks more economically by eliminating the need for a support ship, thanks to its hybrid rechargeable power system, built with Corvus Energy batteries.